Nationally recognized physical therapist launches Disability and Workers Compensation Consultation firm. Industry leader and innovator, David W. Clifton P.T. launches new Disability plus Worker's Compensation firm. DPlusWC offers consulting services across the entire disability spectrum; Rehabilitation, Disability, Work Injury, Utilization Review/Management, Fraud Investigations, Education, Functional Assessment and Injury Prevention, Expert testimony and Legal support services. 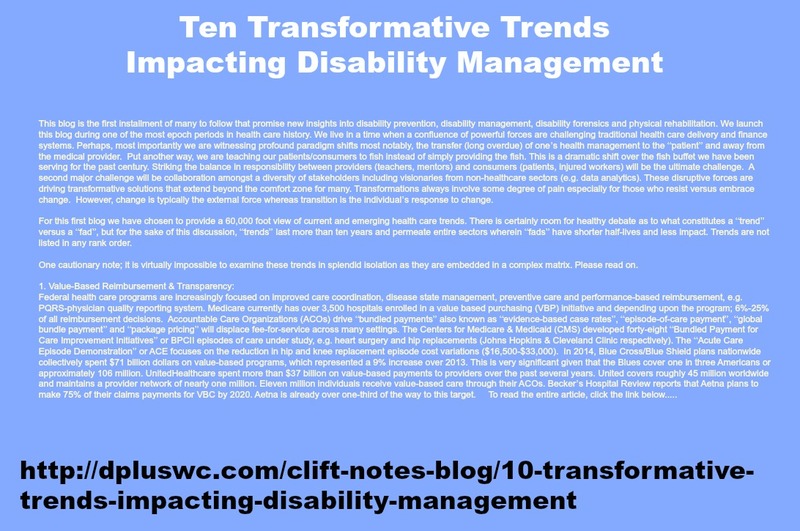 DPlusWC brings clarity and provides solutions for all Disability Management needs. DPlusWC (Disability plus Workers' Compensation) creates solutions across the full disability continuum from injury prevention to assessment. Experts in physical therapy and rehabilitation, DplusWC services include peer to peer utilization management review, workplace ergonomics, healthcare education, Americans with Disabilities Act/ADA, and workers’ compensation. DplusWC specializes in complex cases with employers, insurance companies and third-party administrator's/TPA's, attorneys, case management companies, provider organizations, government agencies and advocacy groups as clients. DplusWC serves our clients to prevent disability whenever possible, manage medical costs, reduce human suffering and dazzle our clients with services available through a nationwide stable of recognized experts who are innovators, change agents and most importantly, compassionate souls. 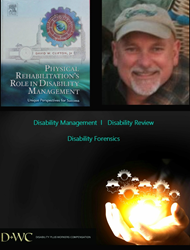 David W. Clifton is a veteran of thirty plus years in disability management. He has an industry wide reputation, with a wealth of experience and knowledge as a physical therapy provider, peer reviewer, author, professor, researcher, consultant and workers compensation patient himself. David developed the nation’s first Peer Review and Utilization Review company specializing in physical therapy and has held numerous leadership positions with rehabilitation and occupational medicine companies and managed care firms. Four previous companies in Disability management, assessment and treatment that were created and developed by Mr. Clifton were also later acquired by publicly-traded entities. Mr. Clifton authored; Physical Rehabilitation’s Role in Disability Management, St. Louis, Elsevier, 2005. He has both teaching and physical therapy degrees and has served as an adjunct professor at three universities in Master’s and Doctoral Physical Therapy programs. He has also served the American Physical Therapy Association (APTA) in the capacity as instructor, task force member, consultant and as trustee/Vice Chair of the Foundation for Physical Therapy Research. David has successfully testified in hundreds of cases ranging from deposition level to Federal Court. DplusWC.com specializes in complex disability challenges and offers consultative services across the disability spectrum from injury prevention, case management including fraud investigations to medico-legal expertise.